Listen to the Iroquois Grandmother. This is a tale of Jonisgyont, the little Squirrel, and how he got wings. In the Moon of the Falling Nuts, when the forest flames with crimson and gold, and the birds preen their wings to fly to the South, Jonisgyont ran chattering up and down the trees gathering brown nuts for his Winter food. Day after day he gathered the nuts, and carried them to a Pine Wood, where he hid them in a hollow Pine Tree. And when he saw that his storehouse was full, he gave little barks of delight, and went leaping from branch to branch. Then he hurried away to the nut trees to play and frisk in the fallen leaves. Poor little Jonisgyont! When he came back to the Pine Woods, he found his storehouse empty, for all his nuts were gone! Up and down the tree he ran, stamping his tiny feet and scolding as he peeped into every small hole, but he could not find his nuts. Then he called to his neighbours, the forest Woodchuck and the green Bullfrog. The Woodchuck came creeping out of his burrow, at the foot of the rock near the Pine, and sat up by his door. And the Frog came jumping from the swamp down by the river. "Poor Jonisgyont!" cried the Woodchuck, stroking his grizzly whiskers. "Who has been stealing all your nuts? Surely he is a rascal and should be well punished!" "I wonder who has done this!" croaked the Frog, puffing out his sides. "He is very cruel to take all your hard-earned food!" And tears dropped from the Frog's bulging eyes. But little Jonisgyont listened in silence, for he knew too well that they were his only neighbours who liked nuts. Now, while the Woodchuck and the Frog were talking, and trying with indignant words to comfort Jonisgyont, Nukdago, the Chief of All Squirrels, passed that way, and heard what they said. "Something is wrong here," he thought to himself, "and I must see that Jonisgyont does not lose all his Winter food." Then Nukdago, the Chief, ran back to the Council House beneath the great forest Oak. And when midnight was come, and the Moon shone bright, Nukdago returned to the Pine Tree and stood in its shadows. Soon the Woodchuck came softly from his burrow, and began to dig in the ground near the tree. And he dug so fast and furiously, that the dirt flew out behind him like a black cloud. "This is very strange," thought Nukdago, "for Woodchuck finished digging his burrow many Moons ago." Deeper and deeper the Woodchuck dug, until he had made a large hole. Then he disappeared into his burrow. Soon he returned with his cheeks puffed out, like a bag full of wind. And as he came creeping along, he looked behind him as if he feared some one might see him. Then one by one he dropped fat Hickory nuts from his cheeks into the hole he had dug. And all night long he carried nuts from the burrow to the hole. And when the Sun began to shine, the wily one covered the hole with grass. "Too many nuts, too far from the nut trees, for lazy Woodchuck to gather!" thought Nukdago, the Chief. "I will return again to-night and watch." And he ran back to the Council House, beneath the great Oak. So when midnight was come again, Nukdago returned, and hid in the shadows under the Pine Tree. Soon the Moon appeared, and the green Bullfrog came jumping from the swamp down by the river. He hid behind a moss-grown stone near the tree, and his bright eyes blinked with cunning as if he feared some one might see him. Then he came hopping slowly from behind the stone, with his throat puffed out like a bag full of wind. He hopped to the swamp, and dropped two Hickory nuts out of his throat, and pushed them under the moss. And all night long he carried nuts from the stone to the swamp. "Too many nuts, too far from the nut trees, for lazy Bullfrog to gather!" thought Nukdago. "To-morrow I must see justice done!" And he ran back to the Council House beneath the great Oak. 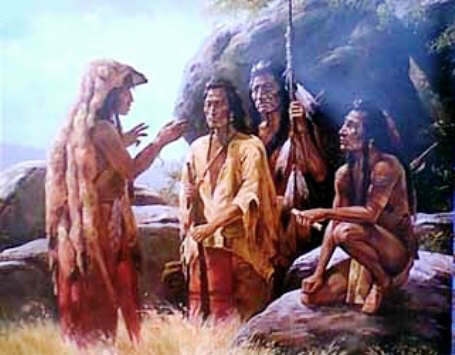 And when the morning was come the wise Nukdago called together all the Big Chiefs of the forest animals. And when they were seated around the Council Fire, Nukdago, sent Jonisgyont to summon the Woodchuck and the Frog. But soon the little Squirrel came back without them, for the Frog had jumped under the moss-grown stone, and the Woodchuck had hidden in his burrow. Then the wise Nukdago hastened to the Pine Tree, and told some of his strongest animals to catch the thieves. Soon they dragged the trembling Frog and the shamefaced Woodchuck from their hiding-places. Nukdago then led them to the Council House, and placed them before the Big Chiefs. And the Woodchuck sat there stroking his grizzly whiskers, while the Frog puffed out his sides with rage. Then said Nukdago to the Big Chiefs: "See these two bad ones? They are thieves! They have robbed little Jonisgyont of all his Winter store." And Nukdago told what he had seen. The Big Chiefs, when they heard this, sent messengers to the Pine Tree, and they found the nuts just as Nukdago had said. Then they made Nukdago the judge, to punish the thieves. So the wise Nukdago said to the Frog: "You belong to a tribe that has always been able to get its food without work. You sit in the Sun, and stick out your long lapping tongue, and catch the Flies and Bugs that pass by your door. But poor little Jonisgyont must work hard and long to gather his food for Winter. You sleep all through the cold Moons, and need no food then. But little Jonisgyont stays awake, and must have food to eat so that he may keep alive. "You have not only stolen, but you have been selfish. Your punishment shall be to lose most of your teeth, so that you can never eat nuts again. Go back, now, to your swamp in disgrace." And as the Frog hopped from the Council House, one by one most of his teeth fell from his mouth. "And as for you, Woodchuck," said Nukdago, "you shall not lose your teeth, but your punishment shall be a just one. You, too, sleep through the Winter, and need no food then. In Summer-time Sweet Clover, rich grains, and berries grow for you; and birds and fish are your food. "You shall not be deprived of green-growing things, but no longer shall you be able to eat birds and fish. Go back, now, in disgrace to your burrow, and stay there until Spring paints your shadow on the snow." And as the Woodchuck left the Council House in shame, he lost his appetite for birds and fish. Then the wise Nukdago, turning to Jonisgyont, said, "Little Squirrel, if you had been more watchful, and if you had not run away to play in the fallen leaves, you might have guarded your storehouse. "Yet I will help you. From now on your eyes shall be bigger and rounder, so that you may see on all sides of you. Webby wings shall grow on your legs, so that you may fly from tree to tree, and reach your storehouse quickly, when thieves are near. But I warn you to hide from the Sun, and work in the shadows." And as the happy little Jonisgyont left the Council House, his eyes became bigger and rounder, and webbed skin grew on each of his sides from leg to leg, to serve as wings when he spread out his feet and tail. And as the little one flew from tree to tree he gave many shrill cries of joy, until he reached his storehouse, and there he found all his nuts again. And ever since then Flying Squirrels have lived in the woods, and Frogs have had only a few teeth, while Woodchucks have lost their appetites for birds and fish. "Froggy! Froggy! my tooth is there! Give me another as strong as a Bear!" And when the Sun paints the forest Woodchuck's shadow on the snow, the Indian boys say, "The Spring is near!"